Glass is a great non-toxic food storage option. While you there are many glass food storage containers out there, one of the most economical options for glass food storage is glass canning jars. When I first started switching my food containers to glass, though, I discovered one unfortunate thing: glass jars can break in the freezer! Not every time, for sure, but enough times to be bothersome. For a while I went back to plastic, as I found broken jars to be too frustrating to deal with. At some point, though, I stumbled upon the secret to how to freeze food in glass jars without risking breakage. Since I started following these rules, I’ve NEVER had a jar break in the freezer. 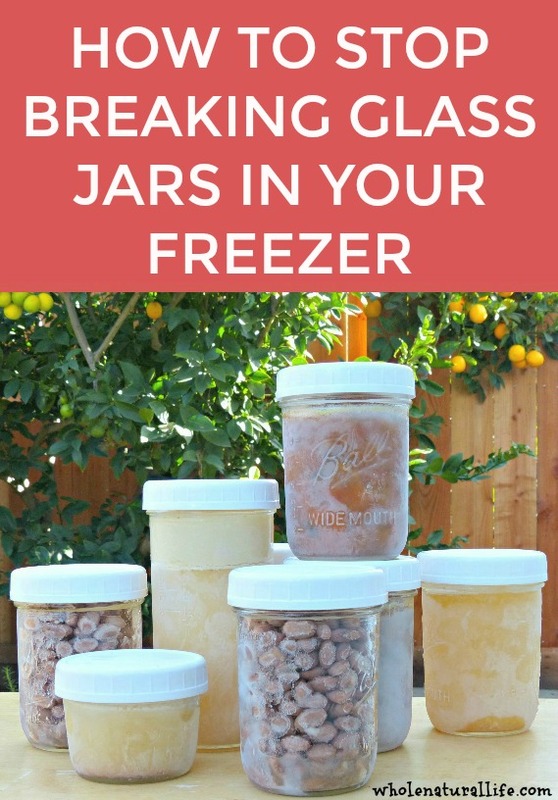 ONLY freeze food in glass jars approved for freezing. As a general rule, this means only freeze food in jars with completely straight sides, like wide mouth pints or regular mouth half pints. 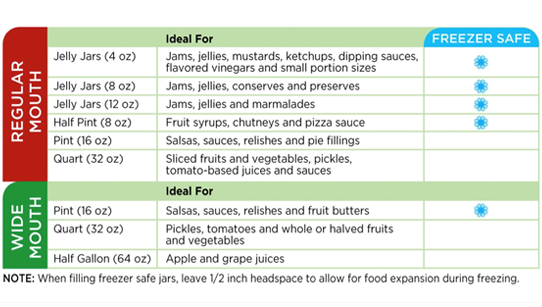 DO NOT freeze food in jars with shoulders, such as wide mouth quarts or wide mouth half-gallons. Shoulders make a jar more likely to break in the freezer. Leave extra space at the top of the jar to allow for expansion during freezing. Many jars have a maximum fill line when you use them for freezing. If you don’t see the line, just be sure to leave about an inch of headspace at the top of your jar. NOTE: Do NOT try to implement this tip alone without following rule #1. In my experience, a jar with shoulders ALWAYS has the potential to break in the freezer, even if you leave tons of headspace at the top of the jar. I’ve always followed the headspace rule, but it wasn’t until I stopped freezing in jars with shoulders that I no longer experienced broken jars. Do not expose your jars to extreme temperature changes. I always cool my hot jars in the fridge, and then move them to the freezer after they’re already cold. When it comes time to defrost, I either defrost jars in the fridge or on the counter. If you need to defrost more quickly, you can usually pop something out of the jar by running it under warm (not hot) water, and then finish up the defrosting in a pot on the stove or in the oven. What do you think? Do you freeze in glass jars? ← Strawberry Kombucha: A Delicious Probiotic Beverage! Not all jars are approved for freezing. If you use jars not approved, miniscule shards of glass can get into the food. You can't see this. Thank you for these tips! I do freeze in jars - occasionally get a crack but for the most part it is very successful and helpful! I freeze in jars a lot! I have been able to freeze applesauce, apple butter, and tons of homemade broth. I have been able to use recycled pickle jars, store bought jelly jars, and salsa jars. I leave 1.5 inches headspace and they go into the freezer on my fridge. Then i move them to the upright freezer once frozen. No problems or cracks yet! I also freeze in jars. As you depict in your photos, I use the plastic lids whenever possible. I also only freeze soups or other high liquids foods after they have chilled in the jar, then with loosely screwed on lids, I freeze until solid. Once frozen, I finish tightening the seals. I hope I am allowing for air to escape as the liquids expand while they freeze. My other tip is to keep frozen jars in a plastic tray so they can't get knocked over and roll out of the freezer when the door is open. I have had broken jars happen that way. Recently my sister told me a trick my mother used (I must have missed that lesson!) I have not had a broken jar since I began doing it the following way. I follow some of your tips like putting them in the fridge to cool and leaving airspace. But then my sister said to put them in the freezer with the canning flat sitting on the jar but not directly on (slightly aschew) After the jar in frozen, I then put the flat on correctly and add a band. I have done a ton of jars including jars with shoulders--both regular mouth and wide mouth. I haven't had any break. I garden a great deal and freeze a great deal. I've been thrilled with this tip. How about the lids, I can see in this picture they are plastic lids how about the original tin lids that theyou come with? Hi Karol, What is your question, exactly? I like using these plastic lids because I find them easier to deal with than the metal lids. But you could use either for freezing. I got my hands on some laboratory glass bottles in 500 ml and 1000 ml sizes, wide mouth. They are very high quality "Pyrex" style (borosilicate)glass and have a shoulder. The big advantage these jars have is that they can tolerate temperature changes, so once you freeze soup in one you can pop it into the microwave directly from the freezer. So far my experience has been limited, I don't count three or four times without breakage a success, but so far so good. I have plastic lids that I leave loose until stuff is frozen, then I tighten. Loosen when microwaving. If this works consistently someone should manufacture pyrex mason jars. Does anyone know if you can freeze glass bottles with swing-top caps (like a grolsch top)? Have you tried it? I would assume no as the narrow neck would create too much pressure.